A new government has started work following a day in which a significant change in the political order in the 26 Counties finally became tangible at Leinster House. Supporters of the right-wing Fine Gael party thronged Leinster House to celebrate the election of Enda Kenny as Taoiseach on what many of them called “the party’s greatest day”. A hugely diminished and defeated Fianna Fail, in the absence of Taoiseach Brian Cowen, assembled in the left corner of opposition benches dominated by a trebled contingent of Sinn Fein TDs and an equally large group of independents. Labour also was celebrating a record election performance with its highest total of seats; the two coalition parties combined occupied more than two-thirds of the parliament chamber. At its first Cabinet meeting at Áras an Uachtaráin last night, the new government decided to cut the pay of senior politicians by just over 6%, a move viewed by some as a first step to meaningful political reform, or by others as a meaningless and token gesture. Following his election as Taoiseach, Mr Kenny told the Dáil the new Government was a partnership between Fine Gael and Labour which would tell the people the truth, regardless of how unwelcome or difficult that might be. After his election by the Dáil, Mr Kenny travelled to Áras an Uachtaráin to receive his seal of office from President Mary McAleese. On his return he unveiled a cabinet that contained 10 Fine Gael Ministers and five from Labour. There were some surprises, particularly the identity of the leading Labour Party Ministers. The biggest shock was that the Labour deputy leader Joan Burton did not get the portfolio with responsibility for public sector reform, for which she had been widely tipped. Instead she was given Social Protection and the position at finance went to the Wexford TD Brendan Howlin who was leas ceann comhairle [assistent speaker] in the last Dáil. 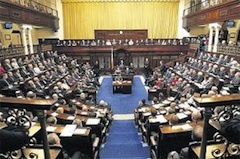 In a cabinet dominated by older men, Labour leader Eamon Gilmore was appointed Tánaiste and Minister for Foreign Affairs and Trade, while former Fine Gael leader Michael Noonan was appointed Minister for Finance. The announcement of the new Cabinet had to be delayed by thirty minutes following a reported protest by Labour TD Willie Penrose following his appointment as a (junior) Minister of State. The deal was sealed, however, when Fine Gael and Labour agreed a programme for government at the weekend after five days of negotiations. Sinn Féin Health spokesperson Caoimhghín Ó Caoláin, speaking in the debate on the new Cabinet, said that the plan was as much the work of Brian Cowen and [former Minister for Finance] Brian Lenihan as that of Enda Kenny and Eamon Gilmore. He described it is a “dolled up version of the Fianna Fail/Green Party plan”. He also challenged new Health Minister James Reilly to reverse the health cuts of the last Government. “The bus has a new driver and a new coat of paint but it’s still travelling in the same direction - the wrong direction,” he said. “The road map was drawn up by Fianna Fáil, the IMF and the ECB. If Fine Gael and Labour stick with this road map they will drive us over the cliff as surely as Fianna Fáil and the Greens would have done had they remained in office. “What was the timeframe the Fine Gael and Labour drafters had in mind when they drew up this Programme for Government? Their eyes were not on the next five years, let alone the next generation. Speaking earlier, in a historic first address to the Dail, Mr Adams demanded a referendum on the banking bailout, the abolition of the Universal Social Charge tax and vowed Sinn Féin would hold Fine Gael and Labour to their promise to reverse the cut to the minimum wage. He also said his party would introduce legislation within 100 days to cut Ministers salaries by 40% and TDs salaries by 20%. Mr Adams said that, in opposition, Sinn Féin would expose the economic and political damage being done by partition to both states on the island. He said the government must actively support the peace process and what he said was the “historic mission to make friends with unionists”. Concluding he said, “Those of us who stand by the Republic, the real Republic, a truly national Republic, will have our work cut out in this institution.